Last year, a Santa Clara, CA startup named GPiO set out to solve the problem of comparing hardware components across vendors. With a veteran audio engineer as one of their founders, they decided to start with the microphone component and grow from there to other verticals. 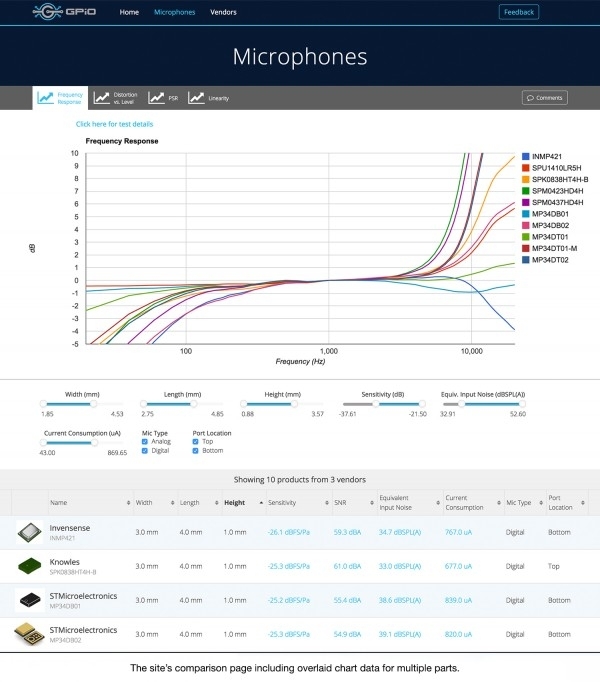 They gathered more than 60 of the top microphones from vendors like Knowles, ST, Cirrus and Invensense, then measured them objectively in their own lab. GPiO, has launched its site ( discovergpio.com ) and is allowing access to anyone on the web, targeting both professional engineering teams and electronics hobbyists alike. This is the definitive place to find a microphone that matches your design needs based on objective performance data and their listing includes analog, digital, ECM and MEMS varieties. The microphone category will soon be followed by battery management ICs and other categories. Visit discovergpio.com to get a free account and view the microphone data.